Make this homemade Punjabi Restaurant Style Chana Masala using my easy and simple recipe. This recipe gets ready in under 30 minutes and is gluten free too. Just skip curd and ghee to make it vegan as well. Here is how to make Chana Masala Recipe. Chana masala is my go-to dish for weekends or when I have guests over. It is such a yummy curry with a beautiful mix of spices. There are many variations of this curry that you can make like Punjabi chole, Amritsari chole, methi chole and more. Every Punjabi family will have their own family recipe for the chana. I assure you this recipe is going to win you praises. 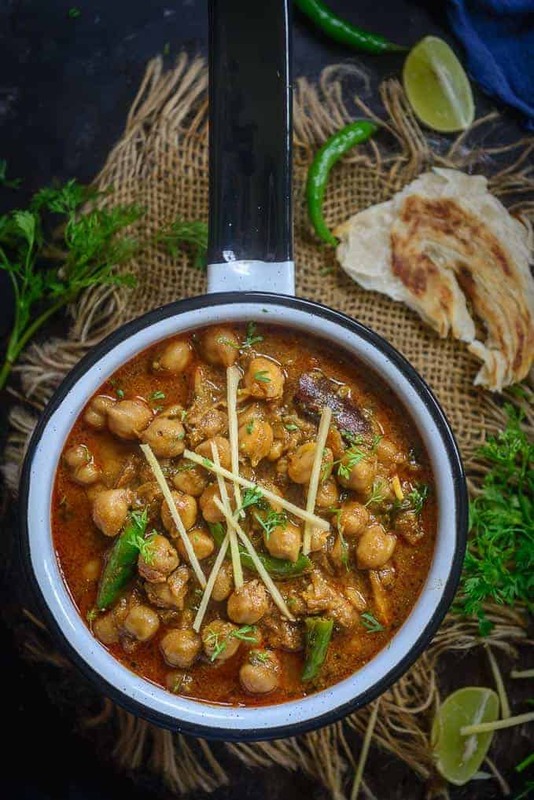 If you are planning to make a chana recipe, give this restaurant-style chana masala recipe a try. Chana masala is a famous North Indian Punjabi dish made using dry chickpeas and spices. It pairs well with any Indian bread or rice preparation. Chana masala gets its dark brown color from dry amla and the whole spices. Now since dry amla is a little tricky these days, I use tea bags to get that black colour and the method doesn’t disappoint. Whole spices used in the dish make it rich and aromatic. Chana, aka chickpeas, have many benefits. They are high in proteins, vitamins, minerals and fiber. They improve digestion, are good for weight management and aid in diabetes management. 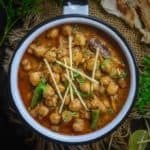 How to make Chana Masala? To make chana masala, soak chickpeas in advance, preferably overnight. Wash the chickpeas to get rid of any dirt and soak in water for 6-8 hours. Drain the chickpeas and transfer to a pressure cooker with tea bag, water, salt, cinnamon, cloves, black cardamom and baking soda. Adding a pinch of baking soda makes sure the chickpeas are cooked through and are nicely softened. If you wish, you can skip adding it. Pressure cook it for 5-6 whistles and remove from heat. Let the pressure release naturally. Be sure to pressure cook the chana on medium low heat otherwise they will not cook evenly. Meanwhile heat ghee and oil in a pan and add hing and onion. Fry until onions turn slightly brown and then add ginger garlic paste and fry for a minute. The point is to get rid of the raw smell and get a nice brown colour of the onion. The final colour of onion will decide the colour of the curry, so be patient with this step. Now add dry masalas -coriander powder, red chilli powder, turmeric powder, cumin powder, ginger powder, garam masala powder and anardana powder. Mix properly and cook until oil starts to separate. Anardana powder and cumin powder gives avery nice colour and tang to chana masala. Please make sure to not skip adding these ingredients. If you think the masala is too dry, add a little water from the boiled chickpeas and get the consistency you require. To this masala, add curd and tomato puree and mix together properly. Let it cook for 2-3 minutes. To this mix, add boiled chana along with the water it is cooked in and cook till you get the desired consistency. While you let the chana simmer, add kasuri methi, green chilli and ginger juliennes. You have your chana masala ready. Don’t forget to garnish with chopped coriander and ginger juliennes. To make chana masala in an instant pot, soak the chickpeas overnight. Next morning, drain and keep the soaked chana aside. Add oil in the instant pot and press the sauté button. Allow the oil to heat for a minute. Now add hing and onion and stir-fry for 5- 6 minutes, till the onions start to brown. Add ginger garlic paste and fry for a minute. Add salt, cinnamon, cloves, and black cardamom and sauté for a minute. Now add dry masala and fry until oil starts to separate. Add curd and tomato puree and cook for 2-3 minutes. Now add chana along with water and tea bags. Secure the lid and close the pressure valve. Set the timer for 35 minutes at high pressure. Once the timer goes off, let the pressure release naturally. Open the lid and add kasuri methi, green chilli and ginger juliennes. Mix properly and garnish with coriander before serving. Yes, chana masala is vegan, if you don’t use ghee and curd. Just don’t use ghee and instead use vegetable oil to make the chana masala and you have vegan chana masala ready. Replace the curd with tomato puree. Is Chana Masala Gluten Free? Yes, chana masala is gluten free. Serve it with rice, millets or gluten-free bread. What to serve with Chana Masala? You can serve chana masala with bhatura, puri, kulcha or basmati rice. It pairs well with any Indian bread or rice preparation. You can even serve it with chapatti or laccha paratha with some pickled onion on the side. I like to serve Achari Aloo along with Chana Masala as it pairs very well with it. Can you freeze Chana Masala? Yes, you can freeze chana masala for up to a month. To freeze, make sure you cook down the chana masala and pack it in airtight containers or individual portions in freezer- safe bags. You can also refrigerate the curry and use within 4 days without freezing. Make this Punjabi Restaurant Style Chana Masala at home using my easy and simple recipe. This recipe gets ready in under 30 minutes and is gluten free too. Just skip curd and ghee to make it vegan as well. Here is how to make Chana Masala Recipe. Wash the chana and soak in water for 6-8 hours. Drain the water and wash the chana once again. Add them in a pressure cooker along with tea bag, water, salt, cinnamon, cloves, black cardamom and baking soda. Pressure cook for 5-6 whistles on medium low heat. Remove the cooker from heat and let the pressure release. Heat ghee and oil in a pan. Add hing and onion and fry until onions turn slightly brown. Add ginger garlic paste and fry for a minute. Add coriander powder, red chilli powder, turmeric powder, cumin powder, ginger powder, garam masala powder and anardana powder and fry until oil starts to separate. Add little water if the masala gets too dry. Add curd and tomato puree and cook for 2-3 minutes. Add the cooked chana along with the water in which they were cooked in the pan. Add some more water if the chana are too dry. Add kauri methi, green chilli and ginger juliennes. Serve hot with kulcha or bhature.